Another lost to the stars…Canadian actor Donnelly Rhodes, best known in these parts as Dr. Cottle in the updated Battlestar Galactica but also for his role of Dutch Leitner on the late 70s ABC comedy Soap, passed away yesterday at the age of 80 due to cancer while in hospice care according to talent agency Northern Exposure. Rhodes most recently made an appearance in the 2016 “Invasion!” Arrowverse crossover as Agent Smith, and he also starred as Det. Leo Shannon in the Canadian series DaVinci’s Inquest. He had many small roles as well, such as the grandfather in TRON: Legacy and a couple of appearances in The Outer Limits anthology series. In all he had appeared in more than 160 series and movies over a 60 year career. I’m sad to say that we’ve lost another icon of SF…actor Richard Hatch, who played Apollo on the original Battlestar Galactica and later had a recurring role on the reboot, passed away today at the age of 71 after an extended illness, while surrounded by his family and friends. Hatch started off on All My Children, then a string of guests spots on a variety of shows before landing a regular role in the last couple seasons of The Streets of San Francisco. He followed that up with his best known role on Battlestar Galactica, for which he received a Golden Globe nomination. After that, he went back to guest roles and lesser known movies, and some short runs on Dynasty and Santa Barbara. 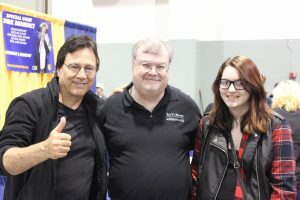 All the while, he kept the fandom of Battlestar Galactica alive at conventions, even writing and producing Battlestar Galactica: The Second Coming, a short featuring several of his fellow cast members in raising interest in the possible return of the series. Even when Universal decided to go for a complete reboot, he felt that any Galactica was a step in the right direction, and was the only original cast member to appear in the new show, in the recurring role of Tom Zarek. I had the good fortune to meet Richard at a smaller local convention a couple years ago, and he genuinely enjoyed talking with the fans. We chatted for a while about his thoughts on the reboot and the differing opinions of his cast mate, Dirk Benedict, who was next to him. He was glad the show came back in any form and was nothing but supportive of the effort. A franchise is lucky to have such a proponent that gets the fans and works with them, and Richard was one of the few. Battlestar Galactica may in fact get it’s long-rumored big screen treatment…Deadline reports that Lisa Joy, currently working on the HBO series Westworld, is working on a script, while Francis Lawrence, who helmed the last three Hunger Games films, may be tagged to direct. The film is expected to be a new retelling, and unrelated to the 2003-2009 remake on Syfy. Bluegrass Films partners Scott Stuber and Dylan Clark are producing with Michael De Luca through his Michael De Luca Productions. Two industry passings were sadly reported this weekend. Tony Dyson, who referred to himself as “R2-D2’s Dad”, passed away at the age of 68. While working at his own studio, the White Horse Toy Company, he was commissioned by George Lucas to turn Ralph McQuarrie’s sketches of a plug-shaped mechanical character into an astromech that would become the most loved droid in two galaxies. Emmy-winning visual effect artist Gary Hutzel, who’s career shot starward when he helped define the look of Star Trek: The Next Generation including the infamous Borg Cube, as well as the U.S.S. Defiant design for Star Trek: Deep Space Nine, passed away on Thursday at the age of 60. Hutzel later worked in movies, including Red Planet and Spy Kids, but would return to television for Ronald D. Moore’s reboot of Battlestar Galactica, where he won two of his Emmys. Just frakkin’ cool…here is every character (and group) callout mentioned in the original premiere episode of Battlestar Galactica, edited into 2 minutes.